Most users strongly prefer watching video from all cameras on a single user interface. Having to switch back between Vendor A's application and Vendor B's application to see different cameras is typically disliked as it forces operators to remember which camera is one which application. This can cause delays responding to threats and, more generally, confusion and inefficiency for ongoing monitoring. This drive is so strong it is a major force for end users to standardize on recording platforms. While some larger end users might have a few recorders due to acquiring new companies or from legacy platforms from years ago, overwhelmingly end users will avoid mixing and matching various manufacturer's recorders (as they often do for cameras). Making sure you can smoothly fast forward, rewind, go frame by frame, go 2x, 4x speed, etc. Searching for alerts, motion detection in a region, etc. Getting the full range of recording functionalities working well can require a lot of work and can hit issues that are potentially insurmountable without changes from the recorder being integrated. Making it worse, political or competitive issues can be even bigger problems than technical ones. Recorder vendors have long recognized that the lack of recorder integration is a key barrier to keep rivals out of existing accounts. This works both ways. If the incumbent recorder in an account allows recorder B to integrate in recorder B's client, recorder B has a much better chance of breaking into the account. However, even if the incumbent recorder integrates B in the incumbent's client, this too would make it easier for B to break in. Indeed, even if an integration exists, a recorder company will often charge expensive license fees for integrating other recorders to dissuade customers to buying anything but their own. 'Standards' are developing but they are still early and have fairly negligible adoption. Both PSIA, through their RACM spec, and ONVIF 2.0 provides defined interoperability methods for accessing recorded video. However, PSIA have advocated theirs since 2009 with nothing much to show. ONVIF 2.0 is much newer and may have more impact but we do not see any indicators yet that recorder manufacturers will use this to open up their platforms to rivals. Even if they implemented 2.0's recording interfaces, how well it would is still a big question given the complexity and performance sensitivity of retrieving recorded video. Very few recorder to recorder integrations exist today. Most VMSes, DVRs, NVRs, etc. support no third party recorders (even bigger providers like Exacq and OnSSI). Genetec and Milestone both support some with Genetec likely having more. However, even these companies only support a minor subset of recorders on the market (and, of course, not each other). 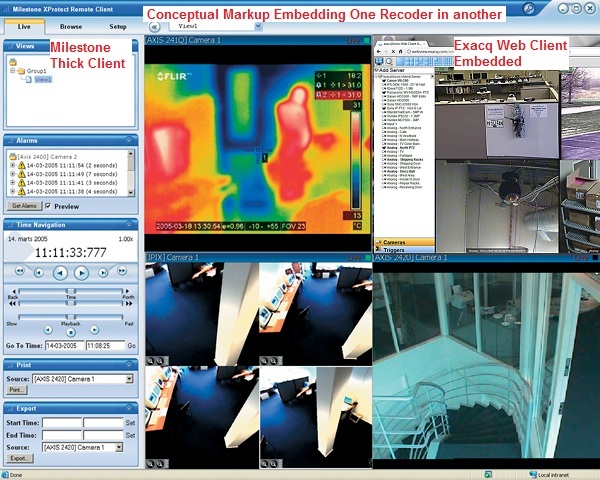 Moreover, often a camera license is required for each channel of each recorder integrated within the VMS, in addition to the original cost of the recorder being integrated, essentially resulting in 'double' payments. Because of all of those issues, most users have no integration of multiple recorders. The rest either integrate through an access control system that can support multiple lines or a PSIM. A common hack to integrate recorders that have no direct integration is to display the web client of one recorder inside the thick client of another recorder. This requires a recorder's thick client to support embedding a web client inside a live view pane (or tile). Awkward Usability: The standard controls for selecting cameras or layouts on the main VMS client will not work with the embedded VMS client. Moreover, embedding the web client into a smaller pane can make it cumbersome to control cameras, move around the web client's workspace and even more difficult with accessing recorded video. ActiveX Control Issues: Often, for security reasons, VMS clients display ActiveX controls from running in embedded web browsers. This can break the web client of many embedded VMS web clients who typically depend on such controls. This might be a step up from simply switching to a different entire application but often not be much. We are not optimistic about this improving. The best shot at this problem being overcome is ONVIF 2.0 and that is still a long shot.